Our Dynamic Color medallions are a set of beautifully colored, hand painted AA medallions with a thin coating of epoxy covering both sides. These medallions are used to celebrate years of sobriety. 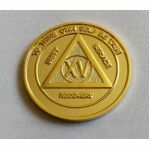 Some AA groups refer to them as Birthday Medallions and others call them Anniversary Medallions. The base material is bronze; then the medallion is gold plated and then color is added. 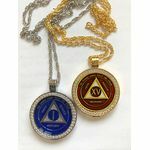 As you can see, we have used dynamic color arrangements that add to the basic design of each medallion. 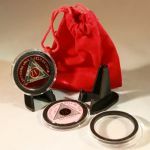 For an extra special gift, you can add our Medallion Gift Pack which makes giving a medallion special. 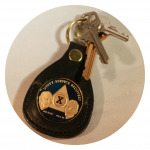 Or order our most popular Leather Key Tags to carry the medallion. This page has a large selection of colored medallions, each of which has the same design with a different selection of colors. The back of these medallions have the Serenity Prayer and the back is colored. Each coin is covered on both sides with a protective epoxy coating. The size is a standard AA Medallion, size 1 - 5/16 inch diameter. The medallion is also thin enough to fit in just about any leather key tag.